In authoritarian regimes it is considered the epitome of democracy: digitization promises us free access to information and open discourse for all. But at the same time, the latest developments in this field are putting our basic understanding of democracy to the test. Big Data and Artificial Intelligence are just two examples of what digitization is doing to us, without us understanding "it." Anyone who uses a digital device leaves a digital trail behind him. Day after day, these traces draw a picture of us that we cannot even begin to grasp. It's not so much about images and information about us that we once put on the Internet and can no longer delete from it. It’s also about behavior we are not even aware of, right up to the speed with which we scroll text onscreen (reading this text, for example). What do all these information fragments say about us? We don’t know and we can’t control it. Am I someone I don’t want to be? This is something new in the history of democracy: that we are somebody – or something? – without being able to influence it. The reason this is so remarkable is that this digital "me" blurs the line between public and private. It – or I? – can no longer visit a website, neither in a café nor at home, without taking part in the site’s optimization. In principle, it’s nothing new, this momentum that technology has always had enabling it to evolve beyond its original purpose. By contrast, as Welzer says, we have never before been in a position where we are not able to predict what technology is doing to us humans. Because never before has a technology so profoundly determined the way in which we interact with each other, namely in our communication. 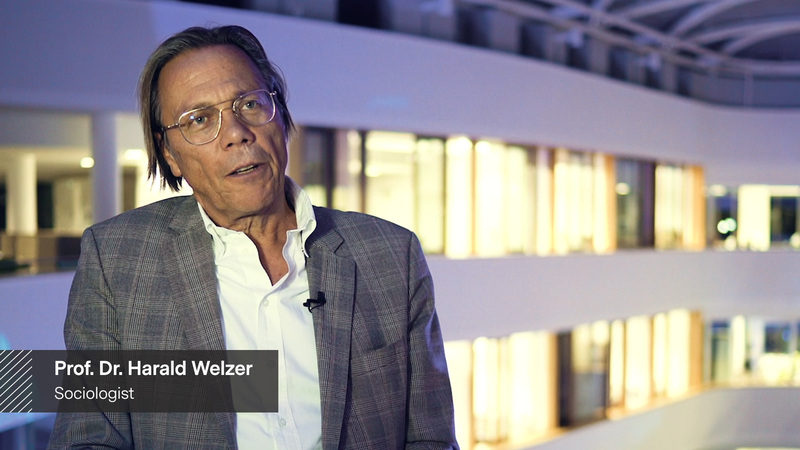 In our video interview with Prof. Harald Welzer, learn how society is having to face the challenges of digitization and Artificial Intelligence. Prof. Harald Welzer is a German sociologist and founder of the charitable foundation "Futurzwei". The bestselling author is one of the most consequential thought leaders of our time. He explores how our society is finding its way toward a desirable future. Welzer is a member of numerous scientific advisory councils and academies. Who are we? How do we live today? And how will digitization change our lives? How the future will unfold is preoccupying society more than ever, with engineers, doctors, politicians – each one of us, in fact – seeking answers. This video interview with Harald Welzer is one of many contributions that shed light on the theme "Digitized Society" from a new, inspiring perspective. We are publishing them here as part of our series "Impact".